“It is very simple: We are overloading the atmosphere with heat-trapping gas and the rest is details,” Mr Vesey told an investor briefing in Sydney, where he again forcefully ruled out any investment in new coal-fired power. He said there were two strategic imperatives that govern all AGL’s investments – affordability and the tenet that the future will be carbon-constrained, making new coal too risky as an investment. …the AGL conclusions were unequivocal. The combination of wind and solar, plus battery storage or pumped hydro, and some peaking gas generators and demand response, was significantly cheaper than the “old coal” option. 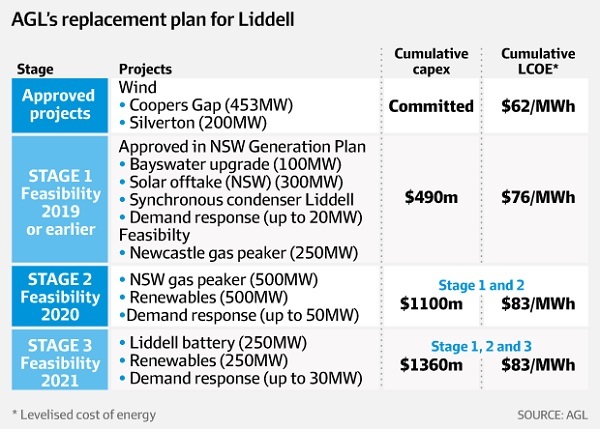 AGL estimated it would have to invest $920 million to keep Liddell open another five years, pushing the cost of its output up to around $106/MWh. This compares to just $83/MWh for the renewable-focused portfolio, including storage and some (expensive) gas speakers. That wholesale price also compares to an average cost of wholesale electricity in NSW in 2017 of around $100/MWh. 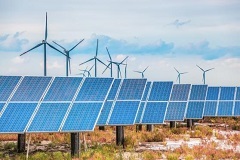 The company says it has already locked in 653 MW of wind capacity – at a cost of $62/MWh – from the Cooper’s Gap and Silverton wind farms, and has signed contracts for 300 MW of large-scale solar with Moaneng, including the 250 MW Sunraysia solar farm near Balranald in NSW. This solar farm will be augmented by the Midgar solar farm, also to be built by Maoneng, which built and operates the 13 MW Mugga Lane solar farm in the ACT. This solar capacity – tied in with an upgrade to the Bayswater coal generator, the installation of synchronous condensers at Liddell, and some demand response and a new gas peaking plant – would cost around $73/MWh. That’s phase 1. There may be a phase 2 and 3, depending on what others do and how the market develops. These phases involve renewable energy totalling 750 MW, another gas peaking plant and 250 MW of battery storage (or maybe pumped hydro) and more demand response costed at $73/MWh. Electricity from the replacement portfolio could be supplied at $83 a megawatt-hour, compared to $106/MWh from Liddell, assuming a $920 million cost to extend the generator’s life for five years. 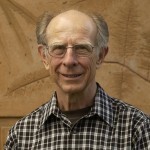 The new plants would have a life of 15-30 years. The scheme involves 1100 megawatts of new “dispatchable” capacity, more than the 1000 MW identified by the Australian Energy Market Operator (AEMO) as the shortfall once Liddell closes. It also replaces the 8 terawatt-hours a year of energy supply that Liddell roughly provides, and would cut AGL’s carbon emissions by 17.6 per cent. Former prime minister Tony Abbott joined in, telling radio 2GB on Monday that: “We need more baseload power. We need more reliable power. We’ve got far too much unreliable power coming into the system. This idea that batteries or even pumped hydro is going to solve all our problems is dead wrong. What is it with these people, stuck in the 20th century? As I explain in an earlier post, the electricity market is being reshaped. What we need now and in the future is better described by base dispatchable, rather than baseload. Roof-top solar will be very disruptive, causing a minimum grid requirement at midday, with a maximum a few hours later. As the AFR piece points out, coal can be unreliable, as when three of Liddell’s four turbines broke down during NSW’s heatwave in February. Furthermore, the future electricity system is going to be decentralised, as Alison Crook eloquently described on the ABC RN’s Science Show. Crook chairs Enova Community Energy at Byron Bay. I have a couple of criticisms of her. For instance, apparently what lies north of the Tweed simply does not exist in her world. She was obviously unaware that some thirty communities in Queensland lie beyond the grid, perhaps the most notable being Mt Isa, and many of them are developing renewables with the support of state distributor Ergon, which is also working with communities on the extremity of the grid to become more self-sufficient. Getting back to Liddell, Frydenberg has sent the AGL off to AEMO, whereas as the law sits Liddell is within NSW, so AGL can do whatever the state agrees with. I’m betting that AGL will have designed its package to meet what the Energy Security Board is laying down as a basic requirement for firmed up power in the new National Energy Guarantee. Under the ESB philosophy more power will be supplied through longer term contracts, so the spot market will decrease in importance. What no-one has woken up to yet is that Queensland has significantly large state-owned generators which can sign up to take the output of smaller renewable generators, as with the Kidston Renewable Energy Hub and the Kennedy Energy Park, and smooth out supply at source in a way that can’t be done where competition reigns supreme. See also earlier post AGL struggles daily to keep Liddell going, and looks to ‘flexible’ power and at RenewEconomy AGL says batteries are coming, but coal is uninvestable, plus other posts at the tag Liddell power station.